Director Professor Howard Riezman represents the University of Geneva (UNIGE) as the leading house and is responsible for the overall management of the network and representation towards the Swiss National Science Foundation (SNSF) and other stakeholders. Co-director Professor Christian Heinis represents the co-leading house EPF Lausanne. He assists and acts as the substitute of the Director. The two directors are supported by the Steering Committee and a management team. Together they are responsible for the implementation of established policies, future directions, general resource allocation, management of the reserve fund, appointment of positions, admission of new members and public relations. The NCCR is also assisted by an Education Committee (in charge of the Master programme) and by a Principal Investigator positioned as Head of the Gender equality and advancement of women section. 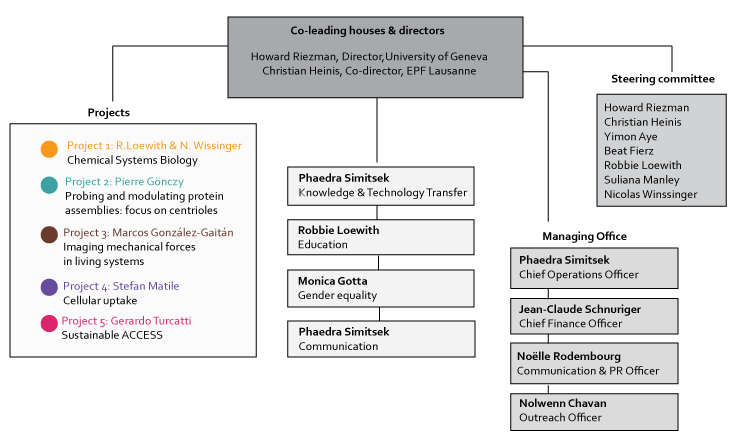 The Management team comprises the Director and the Co-Director, the Chief Operations Officer, the Finance Officer, the Communication and PR officer (75%) and the Outreach Officer (50%). It has global responsibility for all scientific, financial and management issues as well as the activities concerning communication, technology transfer and outreach. The team acts as an operational centre, manages the network together with the Steering Committee, supports the activities in all management areas and provides documents and reports required by the SNSF. 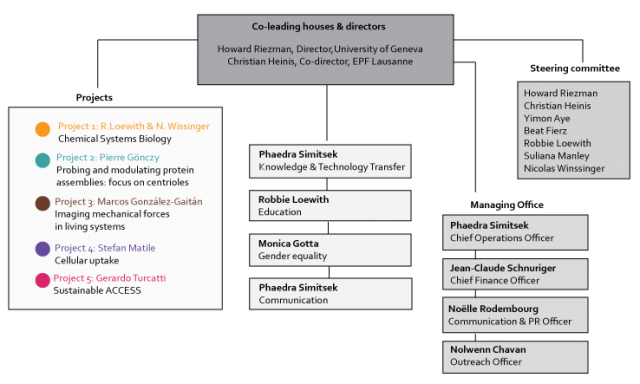 The Steering Committee includes the Director and the Co-Director, the Chief Operations Officer (without the right to vote) and 5 Principal Investigators from UNIGE or EPFL. The Steering Committee is the central leading and decision-making body. Moreover they will meet to maximize progress and coordinate the scientific effort as a whole. The Project Leaders lead 4 global research projects and one platform. They stimulate the scientific discussion, set milestones and monitor the scientific progress within their project. They are also responsible to provide management with all relevant information about their projects. 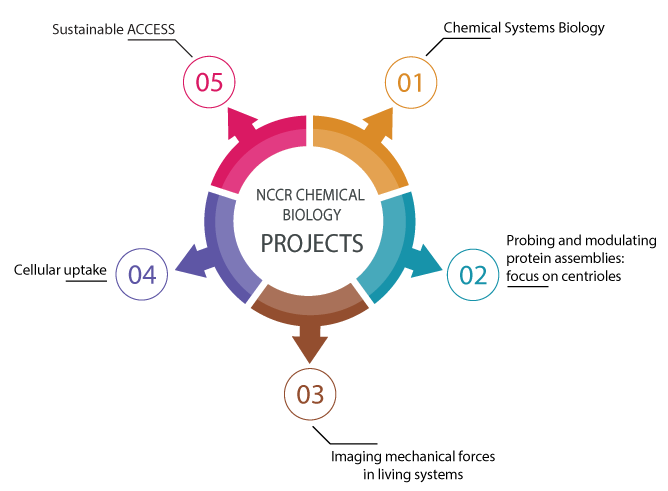 The NCCR Chemical Biology is a network of 23 labs in Switzerland. The members comprise the Project Leaders, the Principal Investigators, research members (postdocs), research students (PhD) and scientific collaborators. 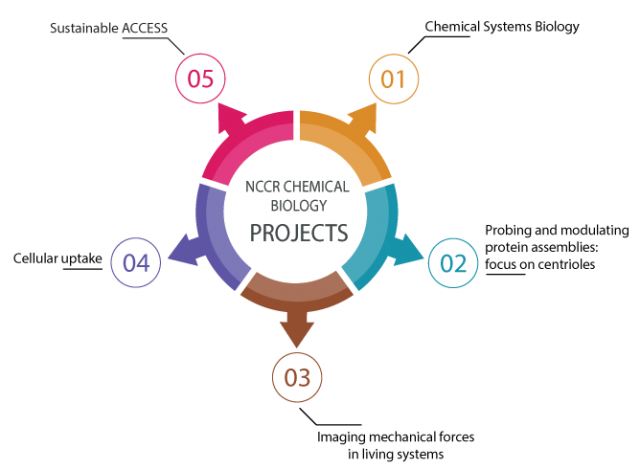 Research members and students are either paid by the NCCR Chemical Biology or involved in the research, but financed by other sources. Principal Investigator proposes the PhD-student or post-doctoral researcher and the Steering Committee approves to support the research project. Former labs are invited to remain in the network as associated members depending on the established collaborations. The Review Panel consists of leading scientists selected by the SNSF which assemble once a year on the occasion of the Annual Site visit to evaluate the NCCR activities, assist and advise the SNSF.